On July 20, National Lollipop Day is celebrated. This food holiday is devoted to candies on stick that come in various shapes, flavors, sizes, and colors. 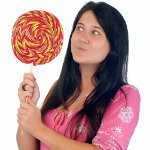 The forerunners to modern lollipops are believed to have been around since the prehistoric are as the idea of a candy on a stick is very simple. The first confectioneries that closely resemble modern-day lollipops date back to the Middle Ages. They were made with boiled sugar. The history of the first lollipops in the United States is unclear. They are thought to have been invented in the early or mid-19th century. According to the most popular theory, modern version of the lollipop was invented by George Smith in the early 1900s. His lollipops were soft, rather than hard. He named them after Lolly Pop, a popular race horse. Lollipops usually consist of hardened sugar and corn syrup with added flavoring. They are mounted on a stick and intended for licking or sucking. Lollipops come in dozens of flavors, colors, and shapes. Sometimes they contain fillings, such as a soft candy or bubble gum. National Lollipop Day is the perfect occasion to enjoy the confectionery that reminds most of us of childhood. Grab a lollipop to celebrate and buy some for your family and friends, too!